Fans of The Great Escape are no doubt aware of the filmmakers’ attempt to help the movie sell in the United States by emphasizing the roles played by Americans, despite the fact that none of the actual escapees from Stalag Luft III in March 1944 were American (though American POWs did help with the digging before they were transferred to another camp.) McQueen’s motorcycle-riding, moonshine-swilling Hilts is obvious, while Garner’s presence as Flight Lieutenant Hendley illustrates another type of American that saw action in the air in World War II’s European Theater: the pilots who volunteered to join the Royal Air Force (RAF) before the U.S. entered the war. These 244 pilots formed the three Eagle Squadrons, created in the tradition of the Lafayette Escadrille that fought for France during World War I. The fact that Hendley is still dressed in the rank and uniform of an RAF pilot adds additional unspoken details about his history. Decorated with the Distinguished Flying Cross (DFC) per the ribbon on his left breast, Hendley must have been shot down sometime before September 1942 when he became a prisoner of war. Despite the nature of our familiarity with Flight Lieutenant Hendley—he is a prisoner of war, after all—the aviator always looks dashing in his full Royal Air Force service uniform, complete with a cream jumper with a neatly rolled turtleneck and his peaked officer’s cap, rakishly tilted in a manner consistent with his easygoing demeanor. In his heroic blue-gray service uniform and cap, Hendley stands out against some of the other downed airmen in their old 1937 pattern brown woolen battle dress garments. Flight Lieutenant Hendley spends his day-to-day life in Stalag Luft III attired in his No. 1 Service Dress uniform consisting of the matching blue-gray worsted wool serge tunic and trousers that has been virtually unchanged since the dress code was first adopted by the Brits in the early 1920s. TV Tropes notes with amusement that, despite being an American officer, Hendley’s particular talent as a scrounger finds his RAF uniform in better condition than the actual British characters. 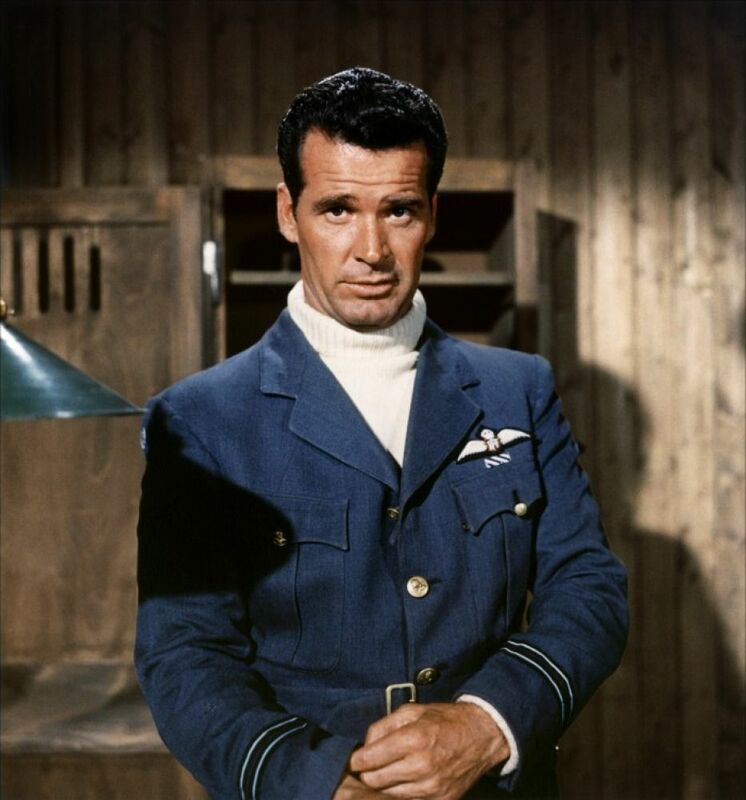 Production photo of James Garner wearing Flight Lieutenant Hendley’s RAF uniform tunic and turtleneck, though his trousers are the striped trousers that match his “escape suit”. The service dress uniform tunic is cut like a single-breasted suit jacket, providing a much easier sample for the camp’s confidential cutters to tailor the garment into civilian wear for the escapees to wear once outside the gates. The waist is wrapped in a self-belt that fastens with a tall, gold-toned double-prong buckle in addition to a four-button front. The tunic has four flapped external pockets, and it may also be cut with the small jetted ticket pocket on the right side, under the belt. The two chest pockets are box-pleated with scalloped flaps that each close with a single gold crested shank button and small snaps at each corner to fasten the flap into place and prevent the pointed ends from curling or folding. The two larger bellows pockets below the belt each close with a plain rectangular flap also with a single centered button. A long single vent extends up the center of Hendley’s back to the belt. Given that this is his service uniform as an RAF flier, the tunic is bedecked with the various insignia, decorations, and badges befitting an accomplished military pilot. Irvin flight jacket in hand, Hendley scopes out the guard towers upon his arrival at Stalag Luft III. On his left breast, Hendley wears the signature aircrew brevet issued to qualified RAF pilots. The patch consists of the letters “RAF” embroidered in white inside a brown wreath with a white King’s crown embroidered atop it, all flanked by white embroidered swift’s wings on each side. Also on his left breast, positioned under his wings brevet but directly above his pocket flap, is the white-and-purple striped ribbon representative of the Distinguished Flying Cross (DFC), an operational gallantry award given to all ranks of British service “in recognition of exemplary gallantry during active operation against the enemy in the air.” Hendley and his fellow Stalag Luft III inmates like Roger “Big X” Bartlett and Danny Velinski all proudly wearing their DFC medal ribbons would number them among the 20,354 real-life recipients of the DFC during World War II. On each upper sleeve, Hendley wears a gently curved navy blue patch with “U.S.A.” embroidered in white, signifying his service as an American officer in the RAF. The more commonly seen Eagle Squadron patch, however, is larger with the letters “E.S.” in white above a white eagle with a black embroidered eye. Unlike the United States, which echoes the Army rank system for Air Force officers, the British War Office deemed that the RAF should develop its own unique ranks for officers. Like his fellow officers Blythe, Macdonald, and Velinski, Hendley carries the rank Flight Lieutenant, equivalent to the army rank of Captain in the U.K. and the U.S. The Flight Lieutenant rank is denoted on the ends of his sleeves with two narrow sky blue rings each placed on a slightly wider black band. In their boundless sartorial wisdom, the British military has authorized for years an elegant ivory rollneck jumper. Colloquially termed the “submarine sweater”, this garment soon found favor not only by the Royal Navy crews in the depths of the sea but also the Royal Air Force officers flying far above them. While the Royal Air Force did offer its own garment to battle the cold weather of an open cockpit—issued as “22G/63 Frock, White, Aircrew”—this is a long and loose knit sweater that has a wide, 2”-tall standing collar rather than the classic rollneck associated with the Royal Navy’s pattern. (Learn more from the intrepid investigators at The Fedora Lounge.) Thus, the garment many associate with the RAF fliers is actually a Royal Navy deck sweater, made for World War II officers by the Leicester knitwear manufacturer J. Pick & Sons. The sweater is a soft ivory 12-ply wool with ribbed rollneck, cuffs, and hem, deeply funneled enough that the neck and cuffs can be comfortably rolled back once and the hem can be comfortably tucked into uniform trousers. Unlike the baggy RAF frock meant to be worn over a uniform, the Royal Navy sweater was designed with slimmer sleeves that could be easily worn under most uniforms from battle dress to an Irvin flight jacket without adding bulk to the arms. Modern shoppers interested in their own off-white submarine sweaters can check out the offerings from Outdoor Knitwear, which has reportedly manufactured the Royal Navy’s wool submariners’ sweaters “for many years”. Given its popularity, many other versions are also available from Amazon, MilitaryClothing.com, Silvermans, Soldier of Fortune, and What Price Glory. Hendley is one of the few in camp who sports a jumper rather than a collared shirt on a day-by-day basis. While the appearance of a submarine sweater with RAF service dress is historically appropriate, there’s also some narrative value to Hendley’s look as the turtleneck adds a touch of relatable rebellion—without going the full McQueen—against the buttoned-up shirts and ties of his more correct colleagues like Bartlett, Ashley-Pitt, and Ramsey. When worn with the tilted cap and the unbuttoned top button of his tunic, Hendley’s look threatens to establish a unique brand of militaresque sprezzatura. Hendley’s double forward-pleated uniform trousers are made from the same blue-gray worsted serge as his tunic. The waistband closes with a hidden hook-and-eye on an extended tab, and there are no belt loops, adjuster tabs, or outside brace buttons for holding up his trousers. They have straight pockets placed vertically along each side seam, a jetted button-through pocket on the back right, and plain-hemmed bottoms. British military knitwear on display. While Hendley sports the ivory Royal Navy sweater tucked into his RAF serivce uniform trousers, “Diversions” expert Haynes (Lawrence Montaigne) next to him seems to be wearing a blue-gray version of the RAF “frock” with its wide standing collar and with the long hem partially torn away for greater mobility and comfort. Since Hendley was sent to Stalag Luft III after being shot down in mid-mission, he is still wearing his flying boots, specifically the 1936 pattern flying boots in black leather. These boots have a smooth plain toe and a strap around the top that fastens through a silver-toned single-prong buckle. He wears them with the heavy white wool knee-high socks that were authorized by the Royal Navy at sea and by the RAF with flight boots. Hendley keeps his boots on even when kicking back in his bunk, as can be seen behind Roger and Colin as they determine the latter’s fitness for escape. Hendley completes his uniform with the RAF’s peaked officers’ cap with a blue-gray barathea wool cloth cover and brim. Emblazoned on the front is the gold RAF officers’ badge consisting of crown, eagle, and oak leaf embroidery. On the opposing wrist, Hendley wears his wristwatch, a simple steel number with a black dial and plain white hour markers, worn on a drab pigskin strap. It’s likely one of the “W.W.W.” (Wrist. Watch. Waterproof.) watches contracted from the “dirty dozen” Swiss watch companies—Buren, Cyma, Eterna, Grana, Jaeger Le-Coultre, Lemania, Longines, IWC, Omega, Record, Timor, and Vertex—who each delivered their own variations of a military watch with a black dial, white Arabic numerals, and a sub-dial. You can read more about military wristwatches of World War II here or specifically about the 12 variations of the British W.W.W. here. 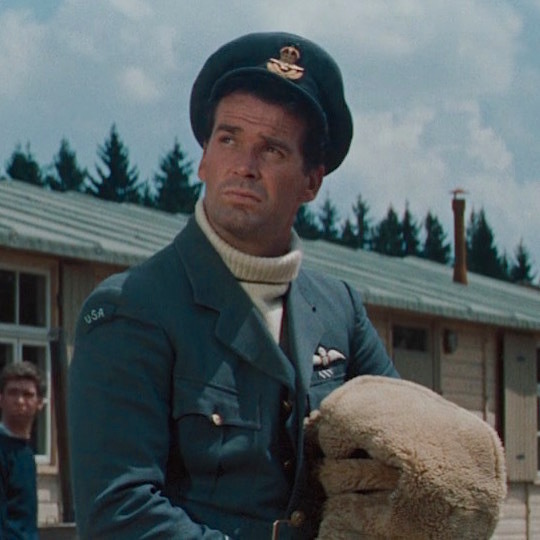 Hendley arrives at Stalag Luft III with his brown sheepskin flight jacket nonchalantly thrown over his shoulder. This iconic coat was developed by Leslie Irvin, the American aviation pioneer who had invented the parachute rip-cord system in 1919 and is credited as the first man to make a premeditated free-fall jump from an airplane. As aviation technologies allowed planes to rise higher and higher over the course of the 20th century, Irvin noted that a better solution was needed to keep pilots warm and comfortable in the sub-zero temperatures of poorly insulated cockpits. The zip-up jackets also have long zippers on the ends of each sleeve and a single-prong self-belt that fastens around the waist. There are no pockets, as the coat was originally meant solely to be worn in-flight over an aviator’s uniform when there would be no need to access one’s personal effects. The RAF’s Irvin flying jackets made quite an impression on the aerial fighting forces of the world, and the U.S. would soon develop its own B-3 sheepskin jacket for its Army Air Forces. The closest Hendley comes to actually wearing his Irvin is slinging it over his shoulder as he scopes out the tools he can steal from a German truck. It’s unfortunate that we never get to see the dashing Flight Lieutenant Hendley actually wearing his Irvin jacket, but Group Captain Ramsey (James Donald), the “SBO”, arrives at camp with his Irvin worn over his service uniform. If you’re in the market for your own Irvin flying jacket, you can check out the selections from Aviation Leathercraft which promotes its wares as the genuine articles as well as the offerings from Aero Leather and What Price Glory. These elements of the classic RAF uniform are undoubtedly familiar to fans of World War II movies like Battle of Britain (1969), where Michael Caine and Robert Shaw take to the skies in their service dress, Irvins, and sub jumpers to defend their homeland against the Luftwaffe. Even as recently as Dunkirk (2017), Tom Hardy’s RAF officer Farrier spent the duration of his screentime in the cockpit of a Spitfire, appropriately attired in an Irvin flight jacket over his service dress and ivory Royal Navy sweater. 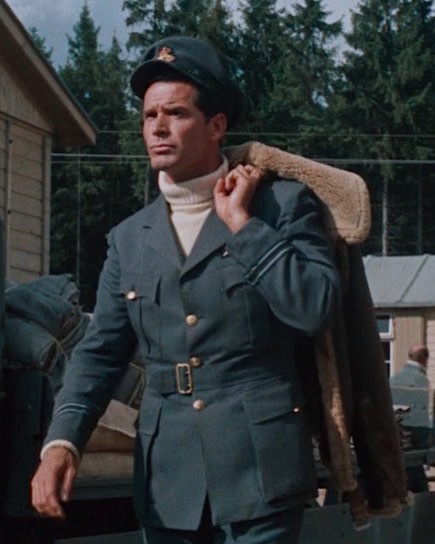 For the titular escape from Stalag Luft III, Hendley is issued a gray striped civilian suit, gray tie, and a “homemade” gray felt fedora by Griffith, the de facto tailor among the imprisoned airmen. The double-breasted suit jacket has broad peak lapels that sweep down to a six-button front, with two to close, and three smaller buttons on each cuff. The ventless jacket has a welted breast pocket and straight flapped hip pockets as well. Like his uniform trousers, the suit trouser waistband has no belt loops, adjusters, or brace buttons, though the bottoms are finished with turn-ups (cuffs). Hendley’s sky blue end-on-end cotton shirt has a spread collar, front placket, no pocket, and button cuffs, similar to the RAF service uniform shirts worn by many of his brothers-in-arms. It’s also likely the same shirt that he wore during the 4th of July celebration. Hendley greets Group Captain Ramsey upon his return to camp with the few surviving escapees. Hendley wears his same boots, socks, and watch while making his escape, although both his bracelet and watch are gone by the time he arrives back in camp with the rest of the recaptured airmen. Bartlett: Where in God’s name did you get these? It’s one thing to be resourceful—scrounging everything from potatoes and a camera to an actual airplane taken during the escape—but Hendley doubles down by using his own natural charm as an asset, earning the fragile friendship and even trust of some German guards by sharing his contraband Lucky Strikes and Dutch chocolates with the young “ferret” Werner. Of course, it’s all an elaborate ruse staged for Hendley to try to force the chocolates on Werner to give him an opportunity to the lift the careless young German’s wallet for a look at the latest ID papers and travel permits that the team forger needs to copy. Hendley isn’t above resorting to pickpocketing to get his hands on resources needed for the escape. 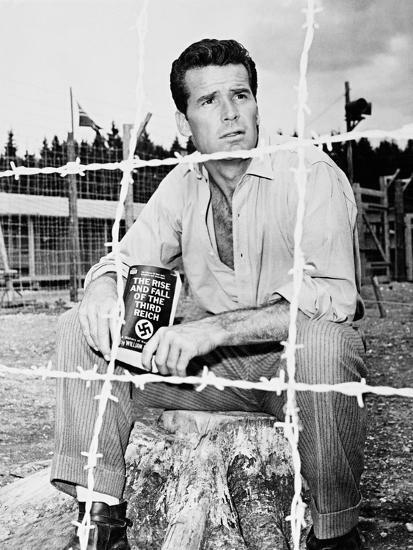 James Garner on the set of The Great Escape, reading William L. Shirer’s The Rise and Fall of the Third Reich. It would have been quite a victory for Hendley to scrounge a book that wouldn’t be published until 1960, but I wouldn’t put it past him! Hendley’s storied resourcefulness is both admirable and helpful, but the character’s greatest trait is arguably his loyalty. When the pragmatic “Big X” Bartlett deems Hendley’s near-blink bunkmate Colin Blythe (Donald Pleasance) to be too much of a liability to participate in the escape, Hendley won’t stand to see the man left behind. Bartlett: Not Colin. He’d be an appalling hazard to the whole escape. That must be my decision. Hendley: You want to talk about hazards? Let talk about hazards. Lets talk about you. You’re the biggest hazard we have. The Gestapo has you marked. No one has said you can’t go. He truly embodies going big or going home, seeing it not as an either/or scenario, choosing to go big—escaping from a Nazi POW camp—in order to go home. Hendley: Come on, Roger. We all know the score here, at least… most of us do. Your idea of this escape is to start another front, to foul up the Germans behind the lines. All right, that’s fine, that’s fine. But once we get passed that barbed wire, once we have them looking all over Germany for us, that mission is accomplished. Afterwards, we have some ideas of our own. Bartlett: You mean getting home? Back to your family and children? 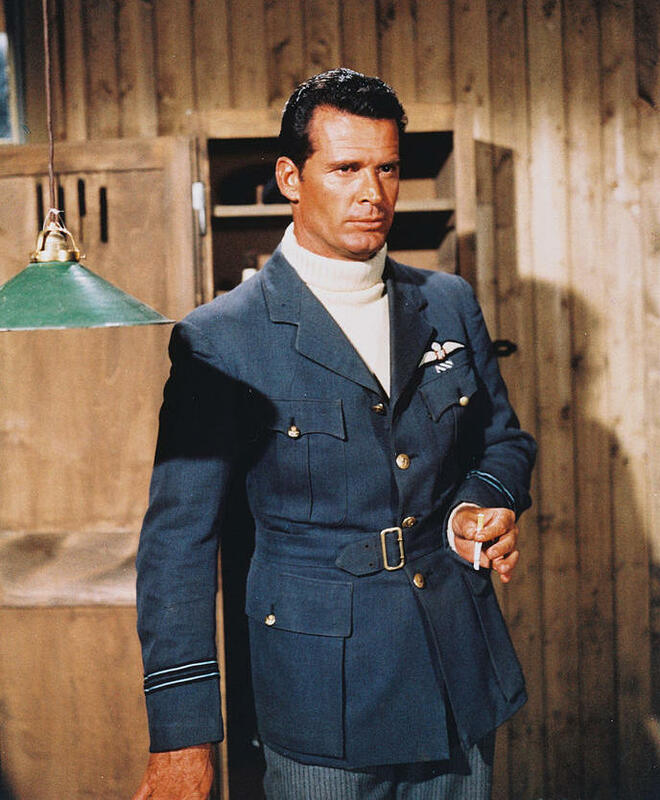 Like his fellow countryman Captain Hilts (Steve McQueen), James Garner’s Flight Lieutenant Hendley manages to briefly get his hands on a German weapon while making his escape. Hendley and Blythe (Donald Pleasance) sneak onto a Wehrmacht airfield, knocking out a German sentry and grabbing the man’s bolt-action Karabiner 98k, the issued rifle for German ground forces during World War II. Hendley never gets the chance to use his commandeered Karabiner 98k, and it’s likely for the best as engaging in combat with the German soldiers pursuing him would have almost certainly led to his own demise. Developed in 1935 on orders from the Heereswaffenamt, the Karabiner 98k is considered among the last development of the Mauser rifle series that includes the venerated Gewehr 98 rifle. The K98k retains the sizable 7.92x57mm Mauser cartridge of the older G98, loaded with five-round stripper clips that only carried half the capacity of the then-standard short magazine Lee-Enfield (SMLE) rifles issued by the British. The K98k was at an additional disadvantage when compared to the M1 Garand semi-automatic rifle fielded by the Americans at the time. Despite the technical advantages of its enemies’ rifles, Germany’s decision to stick with the Karabiner 98k throughout the duration of the war is considered an extension of their military tactic of investing the majority of its firepower on squad machine guns with riflemen engaged only to support the machine gunner’s efforts. Hendley, the dashing, determined, and devil-may-care American airman, counters the expected appearance of a prisoner of war by keeping his RAF uniform clean and unique to his own personality. Check out the movie and read Paul Brickhill’s 1950 book that formed the basis for the movie. Brickhill was an Australian prisoner of war in Stalag Luft III whose claustrophobia prevented him from escaping with the others. After the murder of the 50, Brickhill was determined to chronicle the details of the mass escape. In a gaggle of men noted for beard stubble, shaken skulls, and general spectacular scruffiness, Travis stuck out like Beau Brummel. He’d got his RAF uniform through in a Red Cross parcel, and he pressed his pants every night under his bunk and ironed his tunic with a tin of hot water. He polished his boots, wore a silk scarf, brushed his hair and begged, borrowed, or stole enough razor blades to keep his pink face as smooth as a baby’s bottom. He had a theory that if he went around looking immaculate the ferrets would never bale him up in the compound, as they sometimes did to people, to search for things no model prisoner should have, even to the extent of looking into the embarrassing parts of the body. The idea seemed to work because they never tackled him, which was just as well because he was in the middle of tooling up the engineer’s section and usually was a walking toolshop, with pliers and chisels and hacksaw blades stuffed in his pockets. Colin’s not a blind man as long as he’s with me… and he’s going with me! In addition to Garner’s own experiences as a “scrounger” for his U.S. Army unit during the Korean War, the character of Hendley is believed to be partly based on Charles Albert Cook Jr., an American pilot that had been assigned to No. 133 Squadron during World War II. Flight Lieutenant Cook’s Spitfire was shot down over Brest on September 26, 1942, three days before the Eagle Squadrons were officially transferred, though Cook had technically already been incorporated into the 336th Fighter Squadron of the USAAF. Cook was held at Stalag Luft III at Sagan-Silesia, the same camp portrayed in The Great Escape, though he did not actually participate in the escape. The only Eagle Squadron pilot to participate in the escape, British-born Flight Lieutenant Gordon Brettell, was recaptured within two days and was one of the 50 that was murdered by the Gestapo in the days to follow. About that top button: It was actually common for RAF fighter pilots to unfasten it, as a way of showing off. Sort of like the surgeon’s cuffs on a tailored suit. Other officers, like those who kept their feet on the ground, always kept their tunics buttoned to the top.